The Shih Tzu is a breed that originated in Tibet as a temple dog and was kept by Buddhist monks. The "little lion" was sometimes given to the Emperors of China as a gift. 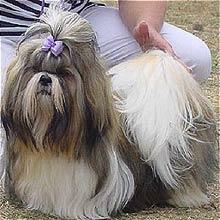 Shih Tzu means "Lion Dog" and they are know to have existed as early as the 17th century in his present form. They are very proud, loyal and intelligent dogs. They love people and are suited to most lifestyles making them a very popular pet. Shih Tzu's are great with children and being very playful soon become a child's best friend. The Shih Tzu is a relatively small dog in size being no more that 26.7 cm tall and weigh from 4.5-7.3 k.g. However being the lion that they are they are they are not small in heart, which makes them a great watchdog. They are ideal house or apartment dogs, but love exercise being an active dog that loves to play. The ultimate lap dog will lie patiently on the couch all day, but seizes any opportunity to play. Their coat is abundant and requires constant care, most pets are kept with clipped short coats making maintenance easier. One of the most distinguishing features of a Shih Tzu is it's friendly face, with a very square, short muzzle and warm intelligent eyes. 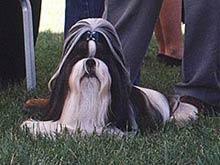 The Shih Tzu comes in all colours and any colour is permissible in the show ring. A perfect member of any family who loves visitors, both human and animals alike.